I love the colouring and markings of this bird and I really pleased with the final painting. An interesting fact about the Yellow Rumped Warbler is that it is the only warbler able to digest waxed found in the bayberries and wax myrtles. They are found across North America and are about 12 - 14 cm in length and weigh between 12 - 13 grams. 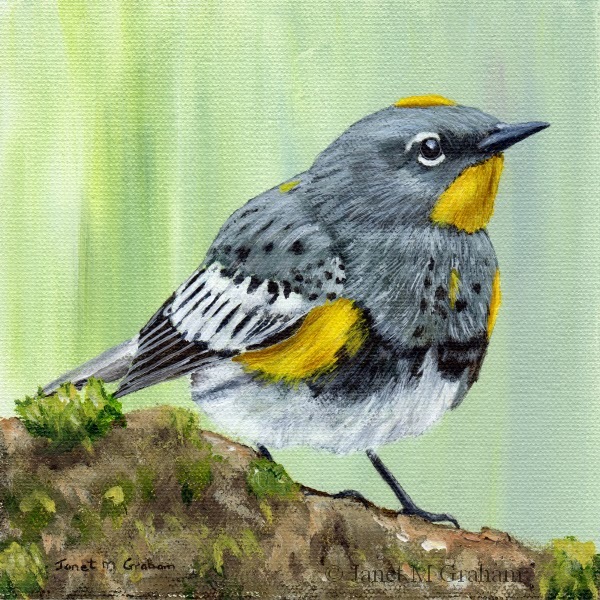 Yellow Rumped Warbler measures 6 x 6 inches and is painted on Raymar's feather lite canvas panel. I had fun painting this one - changed it a bit when compared to the reference photo - added the flowers and left out the rocks. 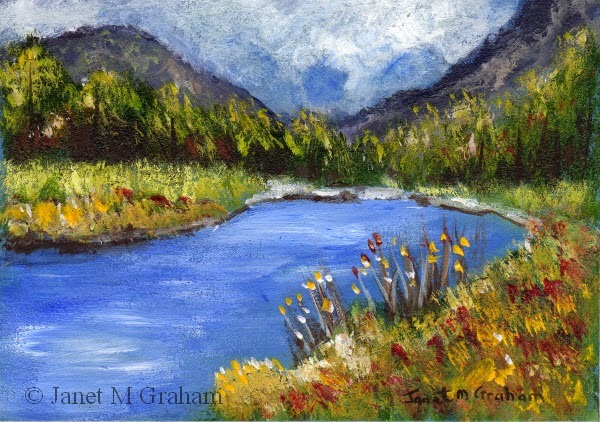 Thinking about painting a larger version of it as I like the river / mountain sitting - might change it to an autumn scene. Spring River measures 3.5 x 2.5 inches and is painted on 300gsm Arches smooth watercolour paper. Many thanks to Carol Vinz for the reference photo. I felt like painting something different so decide to paint this pretty poppy. Rather pleased with the final result - kept darkening and lighting the petals until I achieved the effect I wanted. 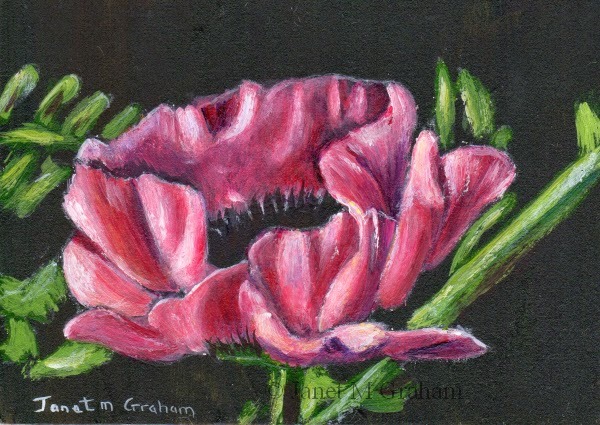 Poppy measures 3.5 x 2.5 inches and is painted on 300gsm smooth Arches watercolour paper. I love paintings robins - they are just so colourful. Really pleased with the final painting. Scarlet Robins are found near the coast from southern Queensland to central south Australia, south west Western Australia as well as Tasmania. They range from 12 to 13.5 cm in length and weigh between 12 and 14 grams. 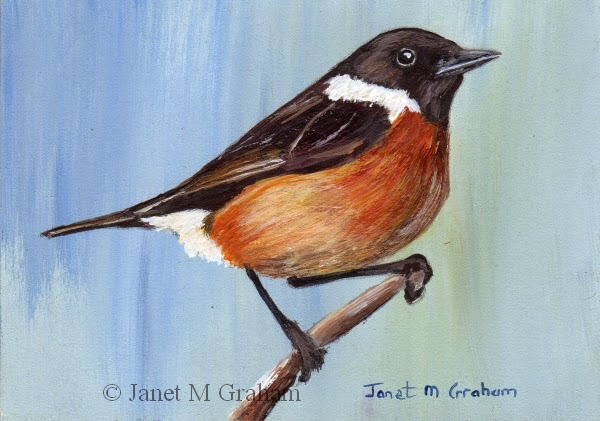 Scarlet Robin measures 3.5 x 2.5 inches and is painted on 300gsm smooth Arches watercolour paper. I love the colours of this birds feathers - very vibrant. The trickiest part was painting the black plumage - used Prussian blue and burnt sienna to add some contrast. These birds nest across much of North America. They are around 11 - 13 cm in length and weigh between 6 - 9 grams. Young males and female American Redstarts have grey and yellow plumage and the male only develops the striking black and orange breeding plumage in its second fall. 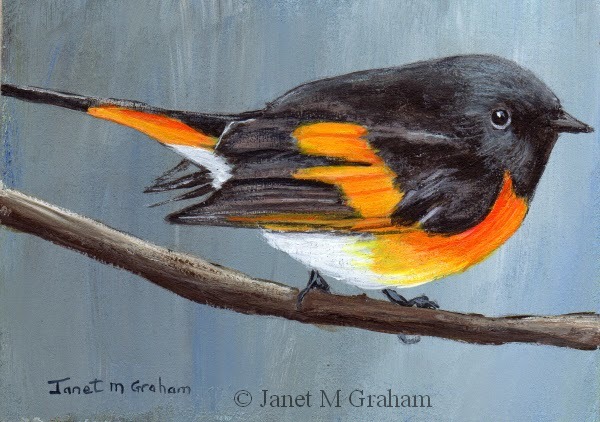 American Redstart measures 3.5 x 2.5 inches and is painted on 300gsm smooth Arches watercolour paper. I really enjoyed painting this one. Everything just worked and I really pleased with the final painting. Used a bit of raw umber for the head feathers which worked really well and Naples Yellow for the other feathers. These birds are found across eastern and south eastern Australia including Tasmania as well as in the southern parts of Northern Territory and on the Nullarbor Plain in Western Australian. They measure around 10 - 12 cm in length and weigh on average 9 grams. Yellow Rumped Thornbill measures 2.5 x 3.5 inches and is painted on 300gsm Smooth Arches Watercolour paper. I enjoyed painting this one and everything just seem to work. Really pleased with the final painting. I thought the berries might be a problem but they turned out fine. I ordered my brushes last week from the UK (http://www.rosemaryandco.com) and they arrived today. Just as well as my no 3 brush is just not holding its point - can't complain though as it has lasted really really well - it is the brush I use to paint the birds and animals so I have probably painted 100 plus paintings with it!!! Yellow Warblers are found across the most of Northern America. The male yellow warbler has a rich chestnut streaking on its breast and belly. They measure around 12 - 13 cm in length and weigh between 9 - 11 grams. 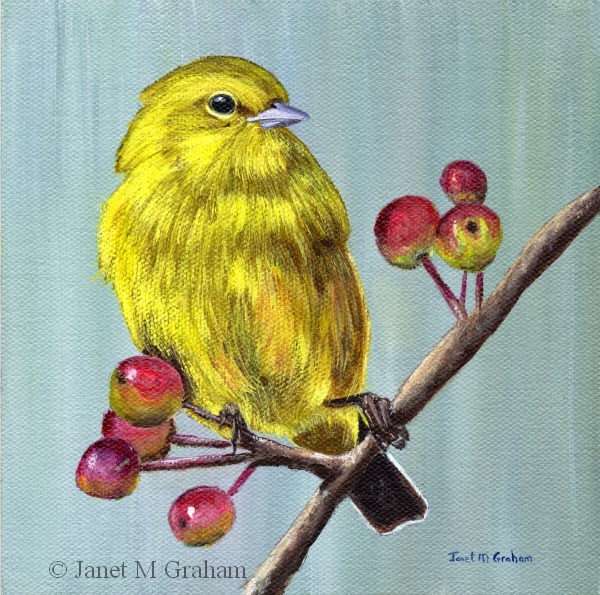 Yellow Warbler measures 6 x 6 inches and is painted on Raymar's canvas panel. So this was the painting that was giving me a few problems when I was painting it but I preserved and I am really pleased how this cute Rottweiler puppy turned out. I decided to name my puppy Rocky - he is just so adorable with those eyes. I love the affect of this one but it was rather a challenge painting black on black so it might be a while before I do another one quite like this. 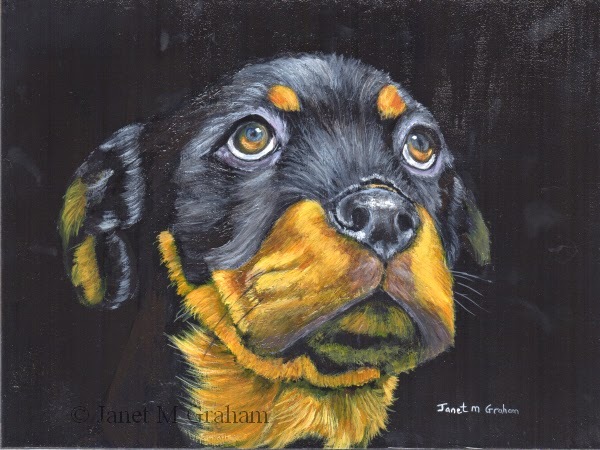 Rottweiler Puppy (Rocky) measures 8 x 6 inches and is painted on Ampersand Gessobord panel. Many thanks to D Major for the reference photo. I love the position this bird is perched on the branch. Rather pleased how he turned out. The European Stonechat measure around 11.5 - 13 cm in length and weigh between 13 - 17 grams. They are slightly smaller then the European Robin. I enjoyed painting this one and really pleased how it turned out. The Pine Warbler is mainly found in pine forests around Northern United States and Canada and the South eastern United States. The Northern Pine Warblers will migrant to the South eastern United States for winter. An interesting fact about the Pine Warbler is that it eats a large quantity of seeds (mainly pine seeds) so unlike other warblers it will occasionally visit bird feeders. Pine Warbler measures 3.5 x 2.5 inches and is painted on 300gsm smooth Arches watercolour paper. I am really please how this painting turned out. Everything just seem to come together with this one. I used a combination of Cadmium Yellow, Transparent Yellow, Titanium White and Yellow Ochre for the feathers plus a combination of purple (Ultramarine Blue + Permanent Alizarine) and burnt umber to darken them. An interesting fact about the American Goldfinch is that is the State bird of New Jersey, Iowa and Washington. 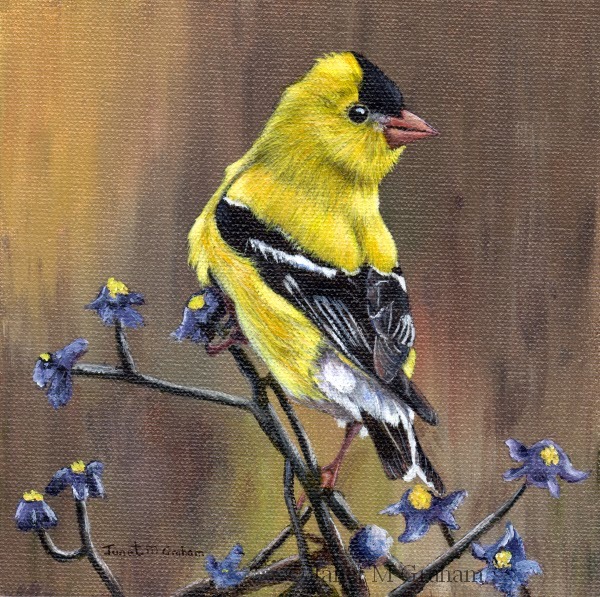 American Goldfinch measures 6 x 6 inches and is painted on Raymar's Feather Lite Canvas panel. I have wanted to painted this cute little fellow for ages. This was the first animal that I have painted on the Raymar canvas panels and I am really pleased how he turned out. I only have a few Raymar panels left so I will have to place another order from the US soon. Also I noticed that my trusty no 3 round brush which I use for every painting is getting a bit worn so I will have to place another order for some brushes from the UK as well - just need to decide on what size brushes I want to order. 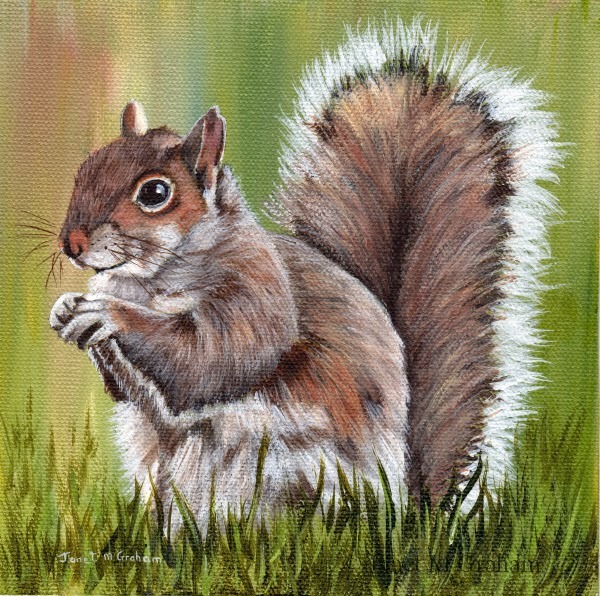 Squirrel measures 6 x 6 inches and is painted on Raymar's Feather Lite Canvas panel. 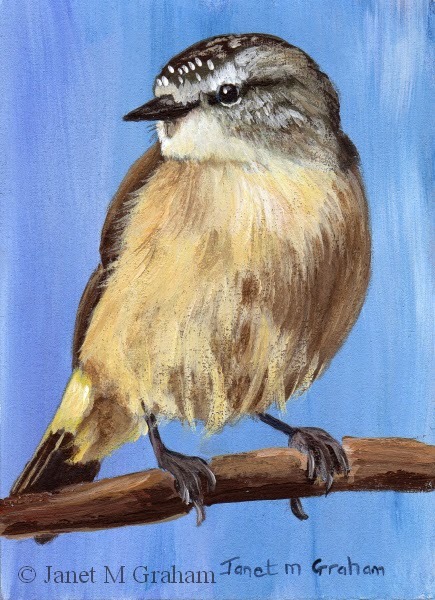 I decided to paint another warbler. This is also a small song bird found throughout the eastern and south-central United States. They measure around 11 cm in length and weight between 6 - 9 grams. 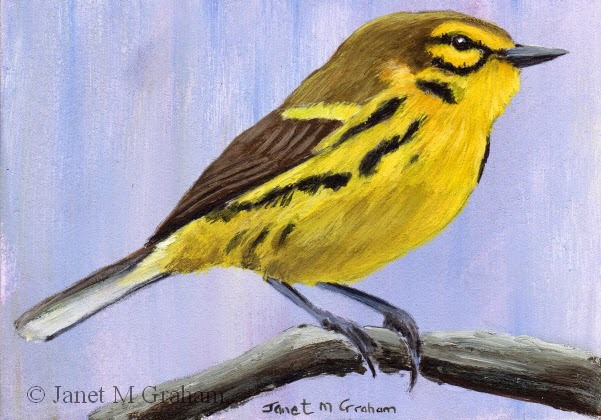 Prairie Warbler measures 3.5 x 2.5 inches and is painted on 300gsm smooth Arches watercolour paper. 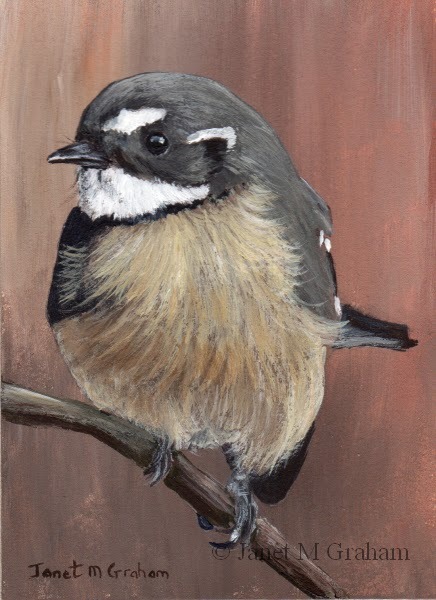 I just can't resist painting this cute little fellow - just love the position he is sitting on the branch and his beautiful plumage. I am really pleased how he turned out. The Blackburnian Warbler is a small songbird found in eastern North America and winters in Southern Central America and South America. They measure between 11 - 12 cm in length and weigh between 8 to 13 grams. 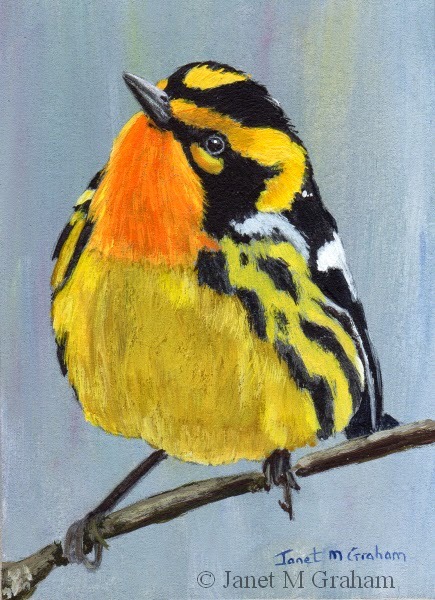 Blackburnian Warbler measures 2.5 x 3.5 inches and is painted on 300gsm smooth Arches watercolour paper. I really enjoyed painting this one and I love how this little fellow turned out. These little songbirds are found across Canada, the North Eastern and western US, Mexico and Central America. They are measure around 8 to 11 cm in length and weight on average 5.9 grams. 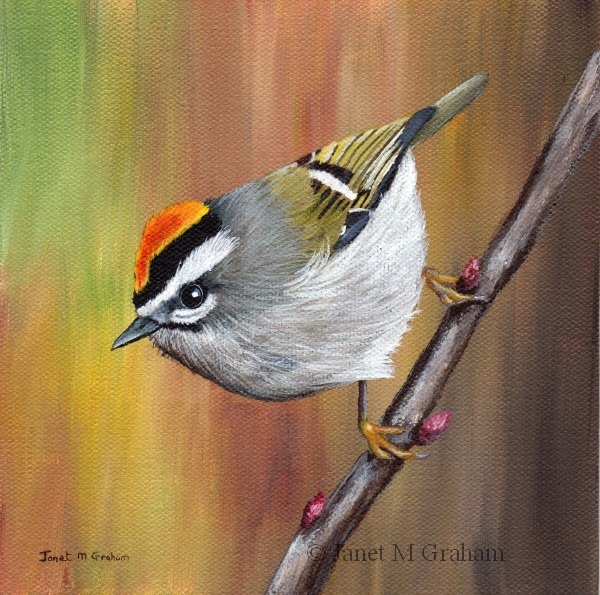 Golden Crowned Kinglet measures 6 x 6 inches and is painted on Raymar's Feather Lite Smooth Portrait Cotton 1/16" panel. I just love the colouring of these birds and the way they can cling to trees. Everything just worked with this one and I am really pleased with the final painting. I am working on a very cute puppy at the moment. However this painting is fighting me every step of the way - funny how paintings can go - sometimes they just seem to paint themselves and other times it feels like a battle. I am sure I will get there in the end. A little bit of information on this bird - it an Eurasian Nuthatch and they are found throughout temperate Asia and Europe. They measure around 14 cm in length and weigh between 17 - 28 grams. 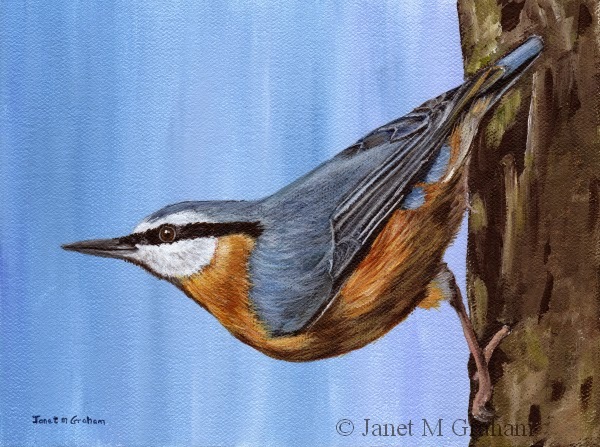 Nuthatch measures 8 x 6 inches and is painted on Raymar's Feather Lite Smooth Portrait Cotton 1/16" panel. Many thanks to Frank Vassen for the reference photos. So this is another species of kingfisher - if I have counted correctly this makes 5 species that I have painted. It is rather amazing how many different species of kingfisher there are. I have a few more reference photos of other species that I plan to paint - just haven't decided if I will paint them in the ACEO size or in a larger format. These kingfishers are widely distributed in Africa south of the Sahara. It is small bird measuring only 13 cm in length. 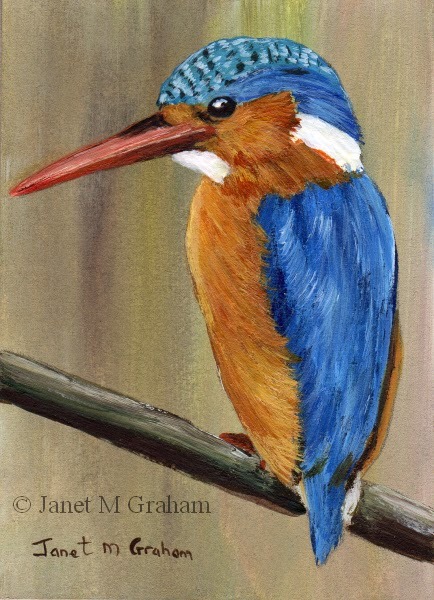 Malachite Kingfisher measures 2.5 x 3.5 inches and is painted on 300gsm smooth Arches watercolour paper. 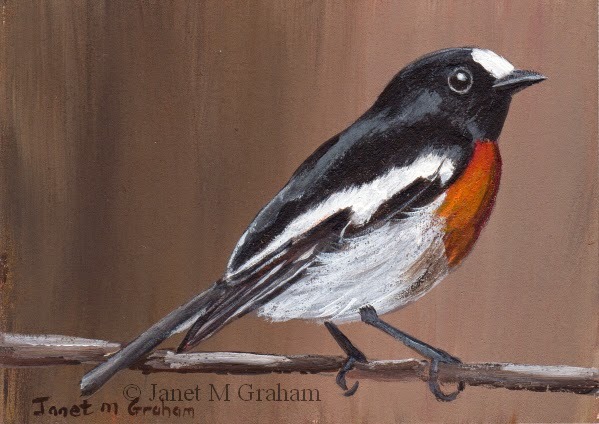 I love the position this bird is sitting on the branch and I am really please with how the final painting turned out. These birds are found throughout Australia and measure around 14 - 16 cm in length, of which half of it is their tail. They weigh around 9 grams. Grey Fantail measures 2.5 x 3.5 inches and is painted on 300gsm smooth Arches watercolour paper. 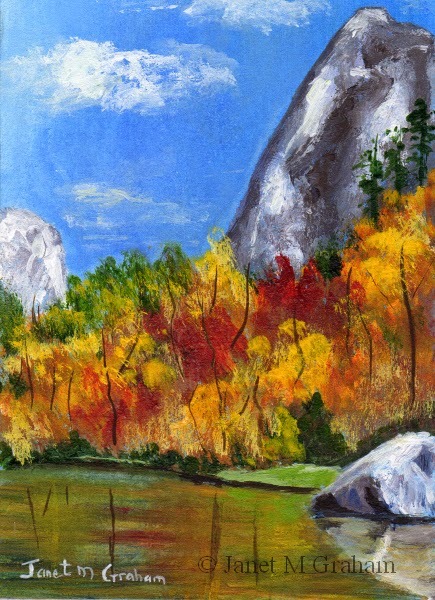 And this was my next little aceo landscape painting. I changed the season to autumn which I think works rather well with back drop of the mountain. Really pleased with the final painting. Autumn Reflections measures 2.5 x 3.5 inches and is painted on 300gsm smooth Arches watercolour paper. Many thanks Barbie Smith for the reference photo. I have painted quite a few larger paintings this week which I will blog about in the next week or so - just waiting for the paint to cure before I can varnish and list them. So I needed a little break from detail and decided to paint a couple of landscape ACEO's. This is the first one. It was rather fun to paint. 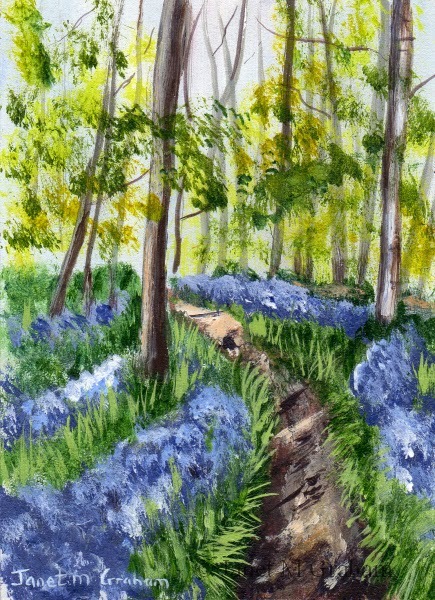 Bluebell Forest measures 2.5 x 3.5 inches and is painted on 300gsm smooth Arches Watercolour paper.